DockDogs® Inc., the Worldwide Sanctioning body and leader in event production for Canine Water Sports competitions has appointed Trudi van de Wint as the new Manager of Affiliated programs beginning February 1st, 2016. Trudi van de Wint will be heading up the Sanctioned Facility and Affiliate Club programs across Australia as a part of the DockDogs® expansion program. Trudi joins the DockDogs® Worldwide Management Team with a plethora of experience. In 2013, she helped start Sydney City DockDogs and she continues to act in the capacity of event manager and certified judge for most events in that region. 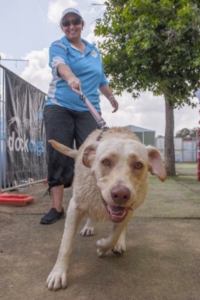 She has also been a member of DockDogs Australia for the past three years and recently was instrumental in setting up better communication processes and transitions between the Worldwide and Australia office programs. In 2015, Trudi built Central Coast DockDogs® from the ground up; gaining experience in business start-up, permitting, dock construction, pool set up, and pool equipment. As Manager of Affiliated Programs for DockDogs® Australia, Trudi will be heading up the Sanctioned Facility and Affiliate Club programs in the land down under and joins the already growing program being organized and operated under Australia’s very own renowned Dog Trainer, Farmer Dave. DockDogs® is the independent governing and sanctioning body for regional, national and international canine aquatic performance sports. DockDogs® establishes the rules and standards of the sport, tracks results and records and supports and promotes the growth of its athletes, events, spectators, and sponsors. For additional information visit www.dockdogs.com or check us out on Facebook at facebook.com/officialdockdogs.